It has been several weeks since the last product review on Loving This Tee, so it’s about time that I present to you another cool tee that I received in the mail! Today’s shirt came to me from a company based in New Jersey called Wolves vs Lions. I actually wrote about this shirt a little while back, so I’m happy to show you what it actually looks like. Along with the shirt, I was also sent a flyer for a fictional showdown between wolves and lions, a postcard, and a button. Although the products shipped in a regular USPS priority mail envelope, the folks at Wolves vs Lions customized this envelope with spray paint. It was a nice touch for a generic mailer. 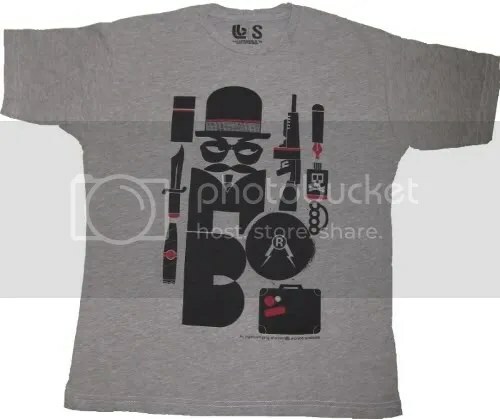 This shirt is called “Weaponized Variant” because it’s a spin-off of another design of theirs called, you guessed it, “Weaponized.” In comparison to the original, this version is printed on a different colored shirt and the design has a distressed look to it. 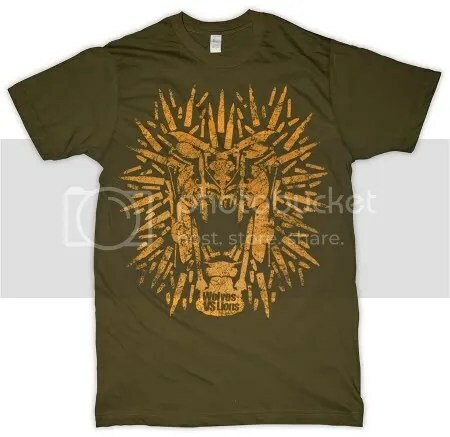 I’m a bigger fan of this more vintage look, so I’m glad that Wolves vs Lions released this version of the design. The shirt is printed on an army Tultex tee. I have mixed feelings about Tultex, as all of their shirts that I own feel different in terms of thickness. While some of them feel extremely thin, others feel more comparable to American Apparel blanks. I’d have to place this shirt on the thicker side, but I don’t know if this is across the board for all of them or just this particular one. Either way, I’m pleased with how this specific shirt feels. After having washed “Weaponized Variant,” both the shirt and ink have held up very well. This shirt feels pretty fantastic, I have to admit. The ink isn’t chunky either, which is a big bonus. I’m not a fan of wearing sheets of ink, so I am very happy that this is not the case for this design. If you would like to pick up your copy of “Weaponized Variant,” head to the Wolves vs Lions shop today! The shirt is currently on sale for $15 and is available in both men‘s and women‘s cuts.